Ten years ago, life was much different than it is today. By the time you’re old enough to read these notes and understand their words and meaning, I’m sure life will be much different than it is now. I’ve heard people say before that every generation has their “defining moments.” Defining, not in that it defines who that generation is, but in that it defines what that generation lost…and what they gained. In my lifetime, there have been few of those defining moments to reflect upon. I was in middle school when the space shuttle Challenger exploded, killing all on board. We watched the launch live from the school library, looking up with amazement as the first teacher in the history of space exploration embarked on a monumental mission, and we watched in awe as something went horribly wrong very early in the launch. I was a sophomore in high school when the Berlin wall came down, marking a historic end to the post-World War II Cold War era. I was a senior in high school when Saddam Hussein and his Iraqi forces invaded Kuwait, resulting in the first Iraq war. Four years later, I was taking a new job with Sonic Drive-In, traveling to Jefferson City, MO when the Murrah Federal building in Oklahoma City, OK was bombed, killing 168 men, women and children. Each of these incidents spark a flood of memories all their own…where I was, what I was doing, where I was going, me feelings about what had happened, my fear of the uncertain future. If you asked anyone who was old enough to remember these events, they’ll tell you the same. Everyone has a story, a slew of memories linking them to each event. Like our parents, grandparents and the generations before them, everyone remembers where they were when their generation’s “defining moments” occurred. It’s odd to sit here and reflect back on life ten years ago. The economy was booming…we had more than we needed, and we lived in abundance…jobs were plentiful, and employers were bending over backwards to recruit and retain good employees…we had freedom. Freedom from fear. Freedom from anxiety. Freedom from the uncertain. We could walk onto an airplane and never once give thought to a terrorist taking us hostage. We could walk into any federal building or national monument, never giving notice to how relatively easy it was to pass through security. We could drive through all 48 contiguous states, passing gasoline tankers on the highway without the thought that someone could use it as a weapon to kill innocent men, women and children. War was behind us…not ahead of us. So we thought. Then on a sunny Tuesday in September 2001, life changed. For some, they met their fate with eternity. For others, they lost loved ones, friends and coworkers. Others ran toward the front lines, doing what they could to protect life. Still others watched in horror, either right there in the thick of the storm. For the vast majority of us, our only connection to that day’s events was in watching it unfold thousands of miles away, on television. It didn’t matter where you were that day. We were one. As a nation, we were one…united together. Banded together as one people, prepared to shake off the dust…save who we could…honor those we couldn’t…lift each other up and move forward together to heal our wound and strike back at those who had taken us by surprise. In the days and weeks following that day, images of solidarity and unity were everywhere. You couldn’t walk outside, turn on the television or surf the internet without being barraged by images pledging to “Never Forget”, that we are “One Nation Under God” prepared to stand and fight with a call to “Let’s Roll”. In those moments on that Tuesday morning and throughout the day, we knew. We knew the moment we watched the second plane crash into the second tower. We knew we were under attack. We knew life as we knew it had changed. We knew this was our defining moment. Some say it was our darkest hour. I choose to believe it was our finest hour. In an instant, strangers became best friends, heroes to each other, performing acts of heroism for those in need. Some say the heroes of that day are the firefighters, police, port authority, and ems workers that rushed in, toward danger to help those in need. While they did indeed perform heroic acts, I know that if you asked them…the ones there that day…they would say they’re not heroes, but they worked with a bunch of heroes. 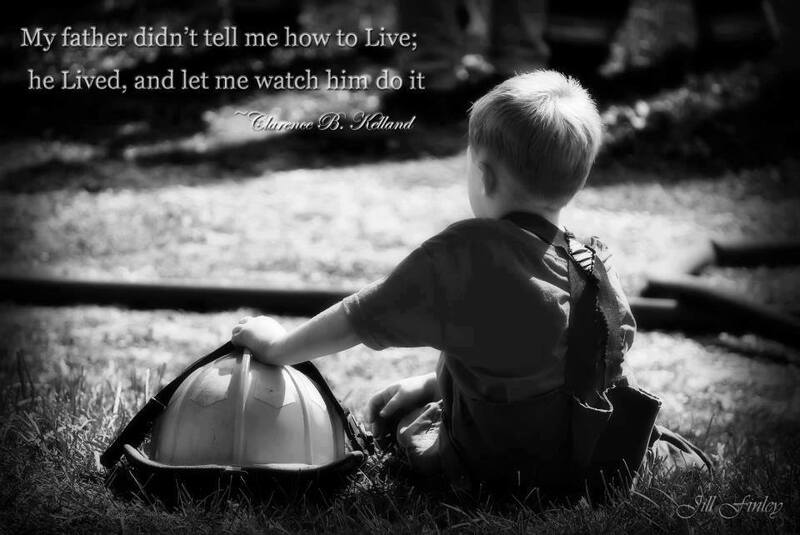 As a firefighter, I can honestly say I’m not a hero. I’ve been called one before. I’m not. I’m a guy doing my job…doing what God called me to do and what the citizens of my fire district pay me to do. The heroes of that day, in my opinion, are the average citizens who rose above their own suffering, pain and difficult circumstances to help another in need. There were thousands of them that day. Yeah, we knew. I was working my part-time job here at the 911 dispatch center that day. I watched in horror as the second plane struck the second tower. We knew we were at war…we didn’t immediately know who our enemy was yet, but we knew we were at war. I watched in horror as both towers fell, knowing that thousands had just perished. Knowing before it was confirmed. I watched footage of the attack on the Pentagon, waiting anxiously to hear news from other possible target location, praying there would be no more. I watched as the reports of another plane crashing in Pennsylvania came in, learning of heroic acts of courage and valor from average people, determined to take a stand. We knew life had changed. We didn’t know yet the extent to which how much it would change, but we knew. In all my years of working at the 911 center, I can say this with absolute certainty. It will go down as the slowest day in history. If the phone rang a dozen times, I’d be surprised. It didn’t take long to realize that everyone with access to a television was seated in front of it, glued to it with an intensity like no other. I still remember calling your mom…asking her if the television was on. On her reply “no”, I told her to turn it on, and she asked “what channel?” I still remember saying something like, “I don’t think it matters. Just turn it on. I love you.” I still vividly remember coming home to hug her and embrace SD with all I had in me. It was a moment of innocence lost, an embrace that spoke volumes about my emotions…as a new dad, it was an embrace of uncertainty, a hug of fear. Knowing that life would never be the same, I wanted to embrace you and your mom as though it was the last time I would ever hold you. Because quite honestly, that day awakened us to the reality that any moment may very well be our last. As you read this, I pray you take from it what God would have each of you individually to know and feel. Know that as a father, my greatest concern is for your safety and protection. Prior to September 11, 2011, it was not the burden it is now. In a post 9/11 world, uncertainty has invaded us. Ten years later, as the nation pauses to reflect on that day, it’s my prayer that we reflect on our emotions of not only that day, but of the days, weeks and months that followed. When we said “Never Forget”, I pray we truly apply those words to an action. Ten years later, it feels as though the country has become complacent again. As the first commercial planes took the air 4 days after the attacks and in the months that followed…on a whole, we as a people didn’t bat an eye when asked to go through much more rigorous security measures at the airport. Today…not so much. I’m just a guy. My opinion is no more important than anyone else’s. What I have to say on this topic is nothing special…it’s quite honestly just the ramblings of a middle-aged man getting older, knowing that my time here is short. In the time I have left, I hope to share with you what I believe God has asked of me. Because, you too will face your own defining moment in history. Your generation will come face to face with its own moment in time when life will forever be changed. When you do, find peace in remembering these words. I believe that in sharing with you my personal story of that day…my emotions, my fears, my resolve, my uncertainty, my memories…in this, I remember. There are wonderful things that can be learned from grief that can’t be learned from laughter. In our grief, we are reminded of the brevity of life. Our time here on earth is short in comparison to the eternity we’ll spend afterward – either with God or separated from Him after our death. Our perception of time is based on what we see, here and now in this life. Instead, it should be based on what is not seen, as through the eyes of God, because God’s perception of time is based on eternity. “Why, you do not even know what will happen tomorrow. What is your life? You are a mist that appears for a little while and then vanishes.” – James 4:14. There is a brevity to life, and we must prepare for eternity. We should examine the purpose and direction of our life. What are we living for? That’s one thing that changed in the aftermath of September 11, 2001. There was a return to religion…to faith…to belief…in something more powerful and more omniscient and omnipotent than us. Even many of those who did not have a personal relationship with God called out to Him that day. As a nation, we turned to God for comfort, grace and peace. We turned to Him for forgiveness of our own sin and grace for our own lives. Ten years later…not so much. As a nation, we have forgotten. Forgotten how we felt that day…how we turned to Him for comfort. And we have once again cast Him out of our lives. As Pastor Ralph explained, how we act in times of adversity determines whether we become bitter or better. “When times are good, be happy; but when times are bad, consider: God has made the one as well as the other. Therefore, a man cannot discover anything about his future.” – Ecclesiastes 7:14. When faced with adversity and loss, we can choose to either blame God or to seek God. Know this, though. We are all going to die…it’s inevitable…there is no escaping it…it is natural. “It is better to go to a house of mourning than to go to a house of feasting, for death is the destiny of every man; the living should take this to heart. Sorrow is better than laughter, because a sad face is good for the heart. The heart of the wise is in the house of mourning, but the heart of fools is in the house of pleasure…The end of a matter is better than it’s beginning and patience is better than pride. Do not be quickly provoked in your spirit, for anger resides in the lap of fools.” – Ecclesiastes 7:2-4;8-9. The end of a matter is better than it’s beginning. Let’s take just a second to break that down. God is basically saying that the day of a man’s death is better than the day of his birth. Why? Because it is in his death that we are reminded of the brevity of life and naturally take pause to reflect on our own life and its meaning. It’s in our grief that we turn toward Him for our comfort, and it’s in Him we find grace. It’s in those moments we can reflect the light of Jesus Christ. God rewards patience. Patience in our grief is knowing that although we don’t have the answers to the question “why?” right now, there will come a day when all is revealed. In one of my personal favorites, Paul shows us in Romans 5:3-5 “Not only so, but we also rejoice in our sufferings, because we know that suffering produces perseverance; perseverance, character; and character, hope. And hope does not disappoint us, because God has poured out his love into our hearts by the Holy Spirit, whom he has given us.” I couldn’t say it any better myself. Like every generation before you, yours will be faced with its own defining moment. Your moment may come with advance notice. It may not. Most likely, it will come like “a thief in the night”. When it comes, I encourage you to rise above your fear. Rest your hope in the Lord and rise above your fear of the uncertain and the unknown. For only God knows the plans He has for us. Be prepared to pick up the sword of freedom and the shield of righteousness to protect and defend your family, your community and your nation. Freedom is not free. It comes at a cost. A great cost of sacrifice. Freedom cannot be passed from my generation to yours…or from yours to the next. Every generation must preserve it for themselves. It’s in the moments you’re defending your freedom that you will encounter your finest hour. As you do, take pause occasionally to reflect. To remember. Because it’s only in remembering that we will truly “Never Forget”.